The Industrial Revolution that forged Dayton, O was built on the backs of many. Where sweat, dirt, and pride were part of the everyday diet. And not until that last bolt was tightened. Or that last drop of hot metal was cast would you hear that whistle blow. Beer time. But not just any beer. One that had the backbone to live up to a real work ethic. 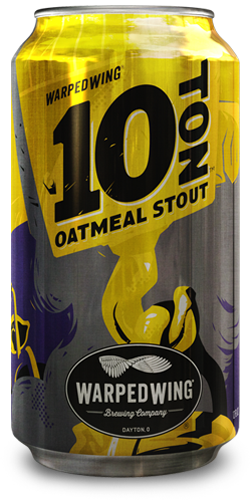 10 TON Oatmeal Stout. Creamy. With hints of coﬀee, chocolate, vanilla, and a roasted ﬁnish. Roll up your sleeves and dig in.